How do plants space out their roots? A Japanese research team has identified a peptide and its receptor that help lateral roots to grow with the right spacing. The findings were published on December 20, 2018 in the online edition of Developmental Cell. This time a joint research team, using plant model Arabidopsis, searched for the gene that is activated by transcription factor LBD16 and successfully identified the TOLS2 gene. The TOLS2 gene is mainly expressed in lateral root founder cells and root germs. 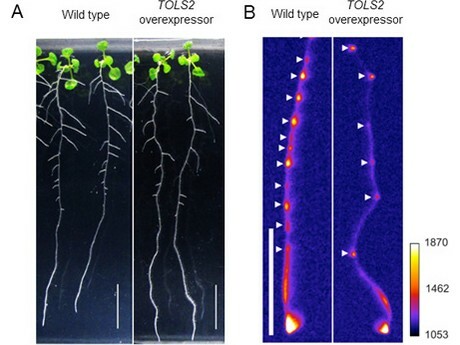 In Arabidopsis plants that overexpress TOLS2, the number of lateral roots decreases (figure 1), indicating that the TOLS2 gene can inhibit the formation of lateral root founder cells. The team analyzed secretions from plants with overexpression of TOLS2 and revealed that the mature TOLS2 peptide is formed from 11 amino acids. 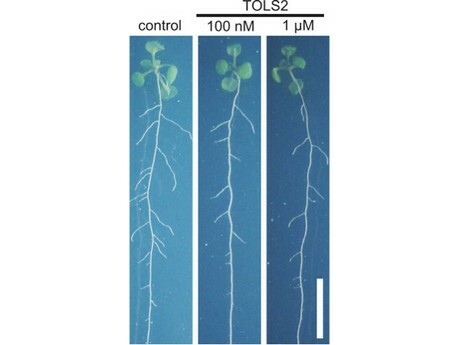 When they artificially created mature TOLS2 peptide and added it to a wild-type Arabidopsis, the number of lateral root founder cells and lateral roots decreased (figure 2). Figure 1: Overexpression of TOLS2 gene decreases the number of lateral root founder cells and later roots. A: Arabidopsis wild-type (left) and TOLS2 overexpression type (right). 10-day growth. Scale is 1 cm. B: The expression of DR5:LUC gene in the roots of Arabidopsis wild-type (left) and TOLS2 overexpressor (right). White arrows indicate lateral root founder cells. The scale is 1 cm. Arabidopsis wild-type (Col) control specimen and two specimens raised in a culture including TOLS2 peptide (100 nM and 11 M strengths). 10-day growth. Scale is 1 cm. Figure 3: Lateral inhibition of lateral founder cells by TOLS2 peptide and RLK7 receptor. (Left) Arabidopsis wild-type 9-day growth. (Center and right) The expression of lateral root founder cell marker the DR5 marker gene (DR5:Luciferase) in the root. White arrows show highly active DR5. At zero hours (center) the parts with active DR5 are drawing closer to each other, but roughly twelve hours later (right) DR5 active is becoming stronger in one part and weaker in the other. 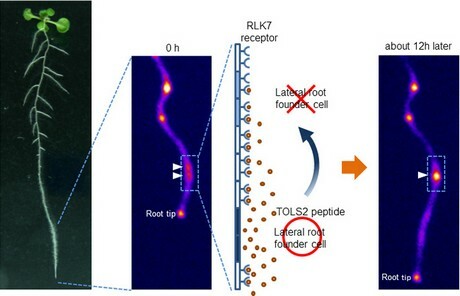 It is thought that TOLS2 peptide and RLK7 receptor work in this way to suppress lateral growth of lateral root founder cells.